In the last article, we discussed how to get your dog hunting by finding tennis balls and dummies then progressing on to the use of the rabbit pen to get your dog enjoying hunting. Some owners do not have the convenience of a rabbit pen and have to work out in the open fields, which can often prove very tempting for a dog. Let's look at how we can utilize both in order to get a steady dog that will sit to flush and then wait to be sent. In preparation for steadiness while hunting, it is important that you have taught your dog to sit to a number of commands; the voice command 'sit', a whistle command - one toot, a raised hand, and in the future, the shot from a gun. We are going to cover reliable sitting at a distance and to other actions - such as the shot from a gun - in the future issues. At this stage, I want my dog to understand that it has to sit to the verbal 'sit' command and also to one toot on the whistle. Usually, this is most reliable when he is close to me as that is all I have taught so far. Personally, the whistle I prefer is an Acme 210 1/2. To teach this, put your dog on a leash and as you walk along, say 'sit'. Take one more step and then stop, lift the leash and guide your dog into a sit. The one-step forward after the command is to allow your dog time to react and then be sat alongside you. When he is doing this reliably, again walk along, blow one long 'toot' on the whistle, say 'sit' and again lift the leash so your dog sits. 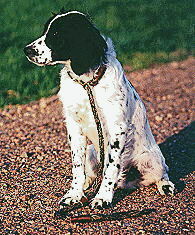 Once he understands the whistle, do not say sit but just lift the leash after blowing the whistle. "Getting the dummy is the big reward for him, so make this for waiting to be sent - and not for going immediately."